The links in this post are Amazon affiliate links. If you click on them & make a purchase, I will receive a very small percentage – like a few cents. However, this does not affect the price you pay for these items or my opinion of the product. 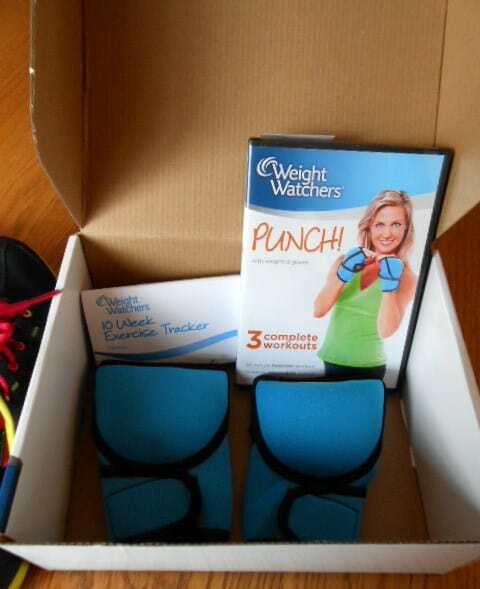 In this post, I’m going to give you a review of my latest weight loss inspiring purchase – Weight Watchers PUNCH! A low impact kickboxing DVD. It’s mid-February and spring is right around the corner. Everybody’s thinking about having to shed their winter coats and layers of clothing and start showing their bodies again. 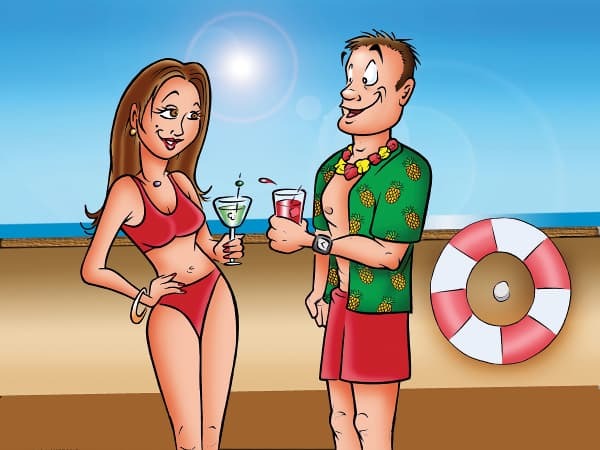 Not only does springtime mean less clothing, but it is also leads into wedding season, outdoor barbecues, pool parties, and then there’s summer. 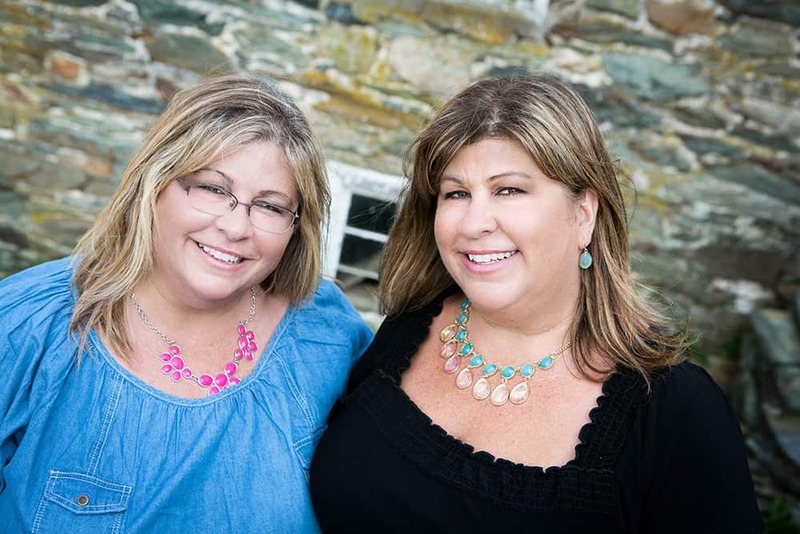 I personally would like to get in better shape not only for my health, which is first and foremost, but also because my youngest brother is getting married in May and I want to feel better about myself in a dress. 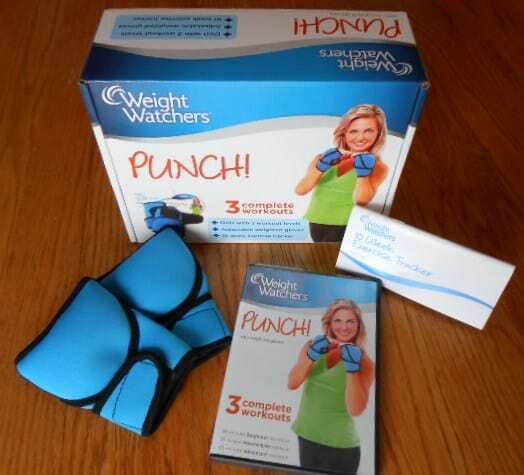 The Weight Watchers PUNCH! DVD includes the DVD, a set of weighted gloves and a 10 week exercise tracker. The DVD has 3 low impact, kickboxing routines. The first routine, which is what I did today, is for beginners and lasts 30 minutes. The second routine is for intermediate exercisers and lasts 35 minutes. And the third routine is for the advanced exerciser and lasts 45 minutes. As soon as I opened that bad boy up, I got my workout clothes on and jumped right in. A little bit of my exercise history: I am a product of the Jane Fonda aerobics video days. I also used to workout at Spa Lady. Does anybody remember that place? I used to do many an aerobics class back in the day. Through the years, as I got older, I stopped taking aerobics classes and changed my exercise-of-choice to non-weight bearing cardio machines at the gym. Recently, I started taking a Zumba class thinking I could just get right back into this type of weight bearing, aerobics class. I quickly and painfully learned that my body doesn’t move like it used to back in my Spa Lady days. Hmmmmph. Go figure. 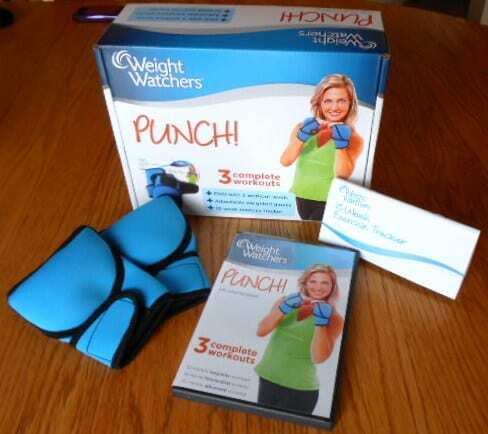 Because this DVD comes from Weight Watchers, they are obviously catering to the woman who most likely needs to lose some poundage and who can’t jump around like a 20 year old anymore. That’s why I felt like this DVD would be right down my alley. And it didn’t disappoint. An added bonus is that I’ve always loved shadow boxing with gloves on. It really gets out my frustrations. Stephanie Huckabee leads this completely low impact routine and is very straight-forward while explaining the easy-to-learn moves. 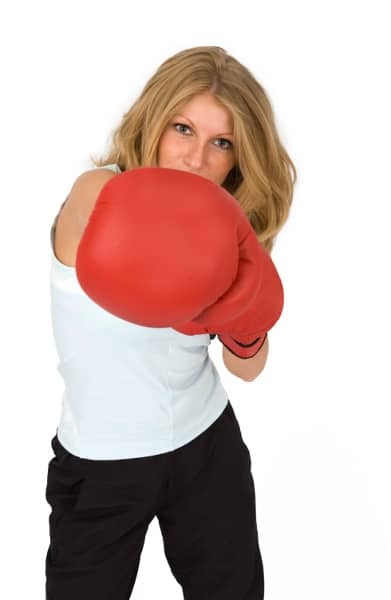 The weighted gloves are 1 pound each and add just enough extra weight to make your arms feel the burn. If I had my preference, I would have liked more motivating hip-hop, Pitbull-style music – the kind they play in my Monday night Zumba class. But if they did that, this DVD would get dated quickly. The music they do play is just a constant beat that is softly playing in the background. Kinda boring, but it does the job. A remedy for this would be to figure out the BPM (beats per minute) for the DVD’s ongoing song and substitute it with more motivating music that has the same BPM. By the end of the beginner workout, I was dripping in sweat and needed water. Success!! The result I was hoping to have. Because they don’t take breaks during the workout, make sure you drink plenty of water before you workout. During your workout, you might need to push the pause button to sneak a quick swig (of water that is). Also, while doing the squats and lunges, concentrate on using the correct form and not pushing yourself too hard, especially if you haven’t done weight bearing exercises in a while. It can be tough on the knees. The majority of the exercises in this DVD are punches (obviously), squats, and low impact kicks. Overall, I would give this DVD a good rating. It does what is says it’s supposed to do and it was a challenge for me. I plan to graduate to the intermediate section of the video as soon as possible. I hope you found this review helpful. If you know of any other good low impact kickboxing DVDs, please let me know. I’d love to hear about it.